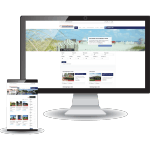 We were contacted by Lee Drywall, Inc. to build a responsive web site for their construction company. They also requested that they needed a web site that they could manage and update on their own. After a small training session they were on their way to updating content and photos in no time.